"Hi, honey. Sorry I'm late I-...Yes, I know I didn't call. I-...Well, my battery died. Nothing I can do about that, bab-...*sigh* Yes, you're right. 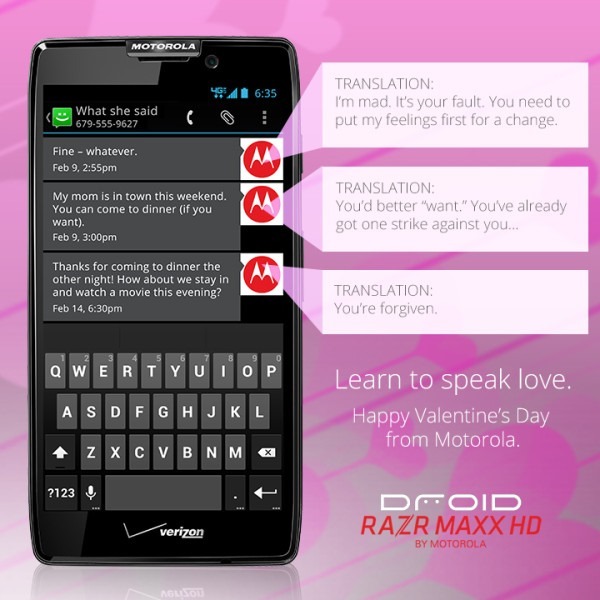 I should've listened to you when you told me to get the RAZR MAXX HD. As usual, you were right and I was wrong and next time I'll be sure to do exactly as you say without-... I am not taking a tone with you! ...Well, what do you want me to say? ...Fine. Whatever. Love you." 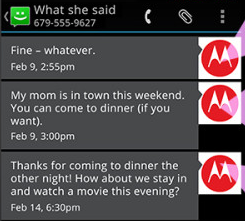 Okay, sure, it seems like Motorola is being a little cynical in regards to how love works. Yes, it reeks of bitterness that it thinks the language of "love" is spoken in harsh, controlling, possessive tones. Maybe it's not Moto's fault, though. After all, we were the ones who gave up on it after the RAZR. Oh sure, we smiled and flirted back like the old days when the original Droid came out, but the magic was gone. We left it clinging to memories of a better time. Motorola has become a shell of its former self. Unable to believe in life after love, the best it can hope for is a pleasant evening out without a fight. Just one. Is that too much to ask for? Can we please have a meal without it turning into "Who didn't update who to Jelly Bean?" We have company, for crying out loud! You're embarrassing us in public! Oh, but I suppose that's what you want, isn't it? You want to cause a scene? You want everyone to know that Motorola doesn't feel good in the hand! ...Look, this is rough. We both acknowledge that. Things are changing in all our lives. Motorola is going through some changes at work right now. The new bosses are coming in, moving everything around, people are getting fired left and right and the whole product line is just in chaos while the mess gets sorted. The stress of that is spilling over and that's not fair to consumers. I...I know Motorola can do better. I know we can do better. Please, for the sake of the children, can we just...start over with X phone?